Trading on the NASDAQ as SMRT, Stein Mart is a top of the line men and women's boutique department store chain. It is headquartered in Jacksonville, Florida, US, and was founded in Greenville, Mississippi in 1908. It has around 260 stores throughout 29 states in the US. In 1908, a man named Sam Stein opened his first store in Greenville, Mississippi. It was a department store that had general merchandise. Later in 1932, Stein's son, Jay, helmed the company and switched focus to discount clothing. 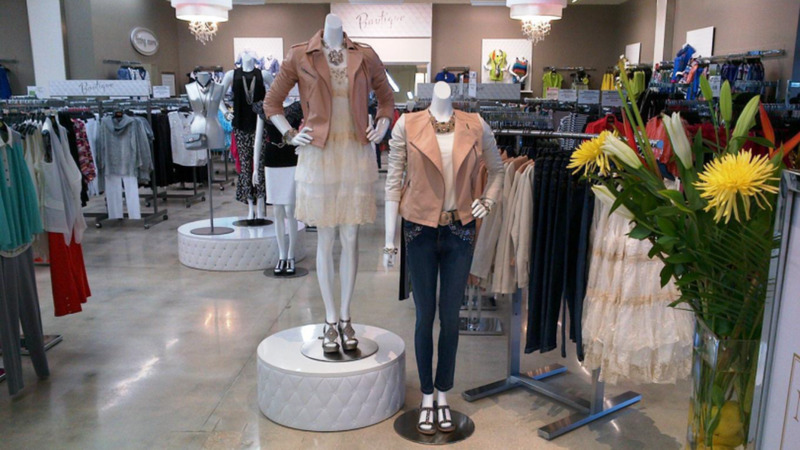 Offering discounts on top clothing lines and fashions, the chain of stores took over as the top place to buy clothing for families in Mississippi. By 1990 there were 40 stores across the country. Jay Stein still services as Chairman and CEO of the company, which makes over $1 billion revenue every year. 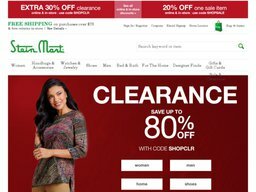 Customers can now shop online at SteinMart.com. Here you can redeem one of our Stein Mart coupons for many great savings and deals. You can also use any Stein Mart printable coupon to make savings in store. Website visitors should also take the time to check out their preferred customer program. This is a way for them to reward loyal customers who shop on a regular basis. Members will receive advanced notice of special Stein Mart sales, discounts on their birthdays, and other special deals such as Stein Mart promo codes. Stein Mart sells a variety of clothing and home items. You'll find categories like women, handbags and accessories, watches and jewelry, shoes, men, bed and bath, for the home, designer finds, gifts, and clearance sales. Women's has clothing, activewear, coats and outerwear, collections, dresses, jackets, blazers, jeans, lingerie, pants, petites, plus size, shorts and crops, bright colored bottoms, fashion solid and knit tops, fringe, lace and crochet, maxi skirts, midi skirts, outfit completer, soft pants, skirts, sleepwear, robes, social separates, sweaters, swim, tops. With handbags and accessories you'll find, beauty, belts, eyewear, hair accessories, handbags, hats, perfume, rain gear, scarves, wraps, socks, travel, tech, wallets, wristlets, colorblock, dome satchels, fringe, laser-cut and perforated, versatile totes, Fabulous Find, Michael Kors Sunglasses, Americana, Summer Nights, This Way To The Beach, Western Flair. In watches and jewelry you'll find boxed jewelry, bracelets, collections, designer, earrings, jewelry organizers, necklaces, men's and women's watches, Adrienne Vittadini, Fabulous Find, Western Flair, animal, black-white and red, metals, pearls, turquoise and shell. Shoes features boots, comfort, flats, flip flops, pumps and heels, wedges, rain boots, sandals, slippers, sneakers and athleisure, evening and wedding, wide width, athletic, casual, dress, sandals, slippers, boat shoes, fashion sneakers, glitz and glam, rodeo, wedge it out, embellished sandals, Fabulous Find, designer brands, and discounts. For men's you'll find coats and jackets, activewear, golf, jeans, pants, shirts, shots, suit separates, sport coats, sweaters, sweatshirts, swim, underwear, loungewear, men's gifts, belts, cologne, hats, socks, ties, wallets, watches, jewelry, Americana, Casual Friday, Alan Flusser, Clearwater Outfitters, Fabulous Find, Southern Pines, Chaps, Greg Norman, IZOD, Island Republic. Many of our Stein Mart coupons can be redeemed across all categories of the site, so be sure to check Coupofy before making an order. Stein Mart accepts all major credit cards, including Visa, MasterCard, American Express, and Discover. You can also use Paypal and gift cards. In addition to using a major credit card, you can also apply for a Stein Mart credit card. Not only will you have the option to pay for your merchandise at a later date, but you’ll also receive special perks for successfully applying for the card. For example, you’ll receive a special gift during your birthday month. Stein Mart coupons can be applied just before the payment step by pasting the coupon code in to the promo box. Stein Mart has several shipping options for both domestic and international customers. In the US all orders over the value of $75 are shipped fore free, which takes between 3 and 8 business days. You can also pay extra for Expedited Delivery, which takes between 1 to 3 business days. International orders are handled through the MyUS.com service which requires a separate registration. Stein operates a 60 day returns policy for package returns or in-store returns. All orders come with a prepaid return label which will be deducted from your refund or store credit, unless the order is delivered in a damaged or defective condition, in which case all shipping costs will be reimbursed.